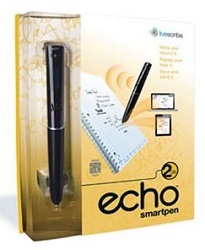 Take the stress out of tests and meetings with an Echo smartpen from Livescribe. Record everything you hear, say and write, while linking your audio recordings to your notes. Quickly replay audio from your Livescribe paper, a computer, or a mobile device - all with a simple tap on your handwritten notes. It's never been easier to take notes and stay organized. Record everything you write, hear or say. Replay your meetings or lectures simply by tapping on your notes. Transfer your notes and audio to your computer via USB cable and Echo Desktop will save everything for fast, easy access to what’s important. Easily share your notes and audio from Echo Desktop as a standard PDF or audio files. A small, light-weight journal for your notes, sketches, and thoughts when you're on-the-go. Enjoy the precision of writing with these Livecribe Echo ink cartridges. Capture lectures, labs, seminars, study groups, and more with these durable college-ruled notebooks.